On September 30, 2014 California became the first state in the nation to enact a statewide ban on single-use plastic bags. In this precedential moment, Secretary for Natural Resources and Ocean Protection Council Chair John Laird applauds the legislature and Governor Jerry Brown for ushering in this ban. 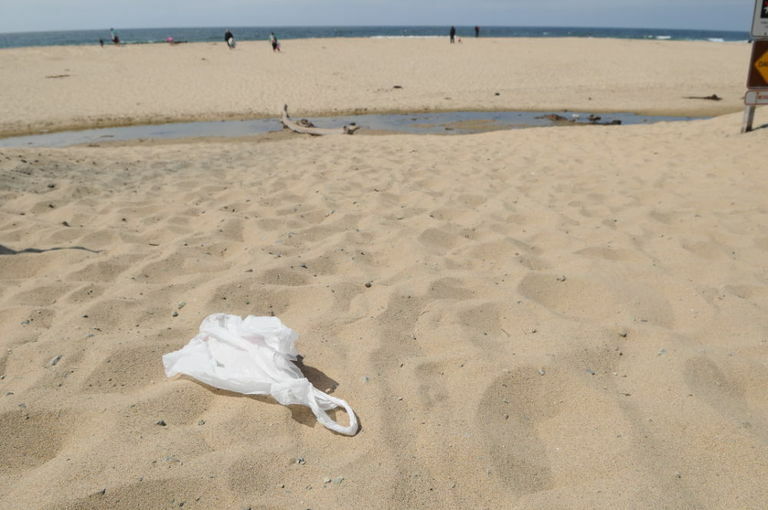 Plastic bags on California beaches are due to be a disappearing sight with the passage of SB 270. Photo: Nic Coury. “Gov. Brown is a true champion for our oceans and environment. By signing into law a disposable plastic bag ban, California can remain at the forefront of addressing the long-term environmental crisis in our ocean. With first-in-the-nation Marine Protected Areas, stringent stormwater runoff regulations, and now this sweeping effort to keep non-biodegradable plastics out of waste stream, we are continuing to do our part to actually solve problems and not just talk about solutions,” said Secretary Laird. The Governor himself was clear about the link between the bill and the impact on our ocean. Assembly speaker and Ocean Protection Council member Toni Atkins also weighed in. In 2007 the Ocean Protection Council convened a California Marine Debris Steering Committee to produce a plan for California to reduce and prevent ocean litter. One of the priority actions identified for producing measurable success was to prohibit specific types of packaging that commonly become litter, such as single-use grocery bags. Every year Californian’s use billions of plastic grocery bags, many of which become litter and clog our waterways and beaches. Bags are the most common dangerous debris item, capable of harming wildlife and humans. With the adoption of SB 270 plastic bags on California beaches are due to be a disappearing sight. The official press release from the Governor’s office can be found on the Governor’s website.